The road leading to Gandaman Dharmasati hamlet in Masrakh block of Chhapra district is quiet, with dense vegetation and fields on both sides. You do not find children playing on the road, even on the warm day in August when I visited. It was barely a month after 23 children died at school after they ate contaminated food for lunch. The Navsrijit Primary school is empty and desolate. Some goats have taken refuge here where once 125 young students gathered. Small, makeshift mounds dot the ground in front of the building: the graves of 17 of the children. They have been buried here by their distraught parents, as a bleak reminder of how poor oversight can lead to tragedy. Broken slippers, a mud oven in the verandah outside the classroom and some papers fluttering in the wind silently testify to the lives snuffed out after that tragic mid-day meal. The Bihar government has given Rs200,000 (US$3,300) each to the grieving parents and relatives as compensation. The authorities have also promised a new high school, a water tank, proper drains and a paved road in the village. But this will not stop another tragedy from happening again or help the villagers become involved in what goes on in schools. The villagers spoke to me of their concerns: “We shall not allow anything to be built in this village unless we are adequately compensated. Our children have died due to the negligence of authorities and now they want to construct this (infrastructure) to appease us,” said one parent. Some parents want the mid-day meal scheme to be scrapped in schools; others felt that it would be better if money or uncooked food grains are given to the schools instead of cooked food. Most complained of poor quality of the food. 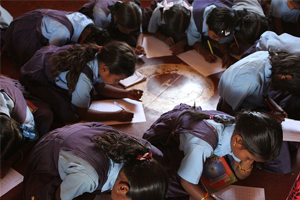 What should happen is the proper implementation of India’s 2010 Right to Education Act at the local level. This act foresaw the creation of school management committees (SMCs) where parents and the school authorities worked together. One goal of these was to inform parents of their rights and give them a greater say in both running the schools and monitoring for corruption. So far in Bihar, like many places in India, this is not happening. Most parents are too busy eking out a living to be interested in what is going on at the school. “After we send our kids to the school, it is for the teachers to take care. In any case, we are afraid to go to the school as teachers complain of being disturbed,” said one parent. “Transparency International India is already working in other districts of Bihar with the school management committees and Shiksha Samitis (education committees). If we get adequate resources, we will work with Shisha Samitis and school management committees in Chhapra district, as well”, said Akanksha Pandey, Director, Pahal Programme of Transparency International India that works on awareness raising and training of marginalised communities in Bihar. Parents and children are the primary stakeholders of an education system and it is they who bear the brunt of the failing school system. They need to be given opportunities and support to bring about a change in the delivery of education. With everyone working together, such tragedies as contaminated mid-day meals can be avoided in the future. But first everyone has to be involved.